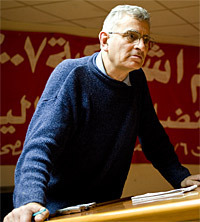 British journalist and political activist for the Socialist Workers Party. Harmann was involved with activism against the Viet Nam war but became controversial for denouncing Ho Chi Minh for murdering the leader of the Vietnamese Trotskists. Harman's work on May 1968 in France and other student and workers uprisings of the late 1960s, The Fire Last Time, was recommended by rock band Rage Against the Machine in their album sleeve notes for Evil Empire.